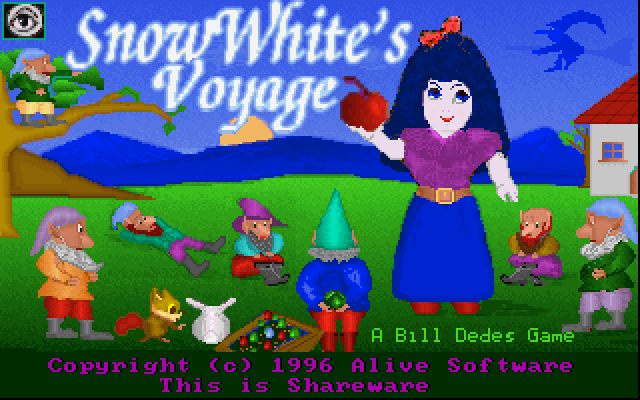 Today I’m looking at a platform game called Snow White’s Voyage, originally released by Alive software back in 1996. Of course by this time Windows 95 had changed the scene quite drastically, with most developers having abandoned developing games for DOS. The game has fairly low system requirements, needing only a 386 and about 512K conventional RAM, much less power than many late DOS machines had. So this game is a little unusual when put in the context of when it was released, it’s like it time travelled by about 4-6 years. The story isn’t quite the same as the fairy tale, the game is divided into 9 episodes with only a few being related to the original story. Each episode begins with a short blurb of story text and a legend of the hazards and treasures to collect for points. The game-play itself doesn’t really rely on the story, so you can ignore it if you wish. 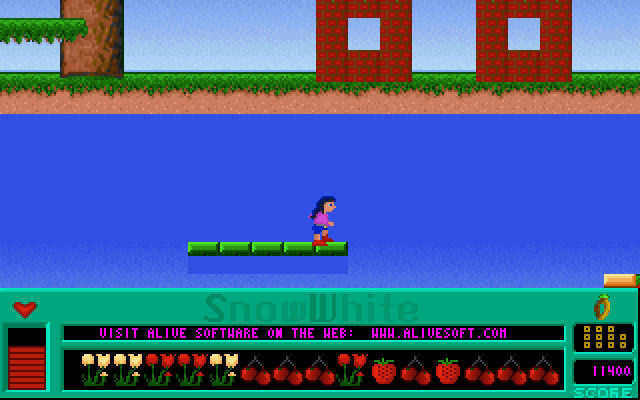 The graphics in Snow White are ok, nothing spectacular, but they do the job. I can totally sympathise, as Alive Software is a one-man software company, I can understand how hard it can be to generate attractive graphics by yourself. The graphics engine seems to be programmed reasonably well, as it appears it would work well on retro hardware like a 386. Although there was one peculiarity, the bottom of the previous level appears to be the ceiling for the one you are playing! Fortunately entities on the previous level don’t seem to be active up there (avoiding slow-down). I’m guessing all the levels are stored together in a single lump per episode. This could have been avoided by restricting the vertical scrolling range, or by only using the tile data from the current level. Apart from looking a bit odd the only problem it introduces is restricting your jump height where it need not be. Digitised sound and OPL music are supported for the Sound Blaster, and some music with basic sound effects for the PC speaker. The music is implemented quite well, although there are no original tunes, I think the introductory tune is from The Marriage of Figaro and reminds me of a Tom and Jerry cartoon where the music was also used. The music resets every time you die or start a new level, which can sound a bit strange, otherwise it’s generally well done. The sound effects are fairly understated but fairly decent for what they are. PC speaker on the other hand is probably best avoided, it’s not the worst I’ve heard, but it’s not the best either. The keyboard controls follow a fairly standard layout for platform games of the time, so getting your fingers on the right keys isn’t too hard. Basic movement works well enough but I found the jumping mechanic a bit of a problem. Basically your horizontal movement in a jump is about half as fast as your normal speed. The main problem this creates is difficulty in jumping over obstacles that otherwise shouldn’t be all that hard to avoid. There are also some problems navigating up some tiles that are intended as ladders. Luckily the game has an easy difficulty option that removes some of the more difficult hazards making it much easier (but still challenging) to progress. The enemies aren’t too hard to dodge, but they are deadly accurate with their projectiles which are difficult to dodge. The worst ones being low flying birds that basically drop un-avoidable eggs on your head. Part of the issue is you basically have to restart the level every time you are hit, making any hit at all very punishing. It’s confusing because you have hearts that are like hit points/health in other games. Fortunately the level doesn’t reset when you start again, so bad guys stay dead if you’ve killed them. Luckily the levels are quite short, so you’re never sent too far back, but being so short and limited in height has meant there is not that much variety in the map design. I did only get to play the first episode however as I played the shareware episode, and I’ve noted that later chapters do change things up a bit. 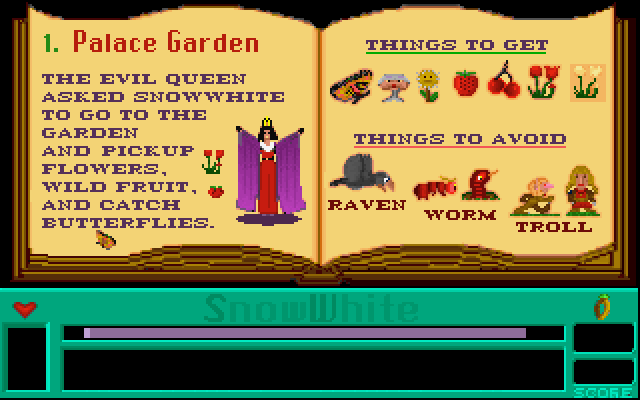 In the lake for instance the game becomes top-down as you guide Snow White around on a raft, in the later stages of the game you play as Prince Charming, so there’s some variety, just not so much in the shareware chapter. From what I’ve played Snow Whites Voyage is ok for what it is, but clearly it’s not a classic like say Commander Keen. Alive Software are still around, and you can buy this game in a bundle with some of their other legacy titles for about $5 USD which honestly isn’t too bad if you have any nostalgia for their games.